Every month, your friends at Kentwood Ford and K97 team up to showcase the best Ford models Albertans can get their hands on. Last month, K97’s own Pete Potipcoe drove in an all-new Ford Super-Duty F-350 King Ranch® edition. Check out what this bad boy has to offer! The 2019 edition of the acclaimed heavy-duty pickup truck doesn’t hold back this year. It’s still got all of its amazing power, with your choice of the 6.2L Flex-Fuel Gas V8 engine and the 6.7L Power Stroke Turbo Engine, as well as a maximum conventional towing capacity of 15,000 pounds. The Super Duty doesn’t hold back on modern driving features, either. Most notably, the Ford Super Duty lets you add FordPass™ Connect to get incredible 4G LTE and Wi-Fi capabilities. We gave Pete the F-350 King Ranch® edition of the Super Duty, which includes almost every luxury feature you could ask for on a truck. 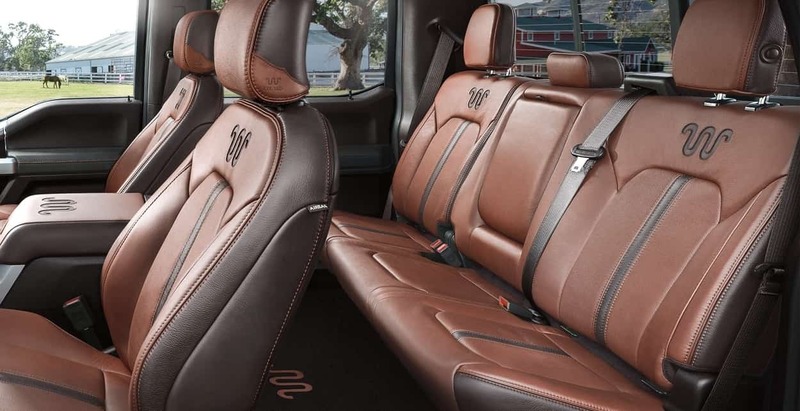 It includes unique Mesa Brown leather upholstery, a premium B&O™ Sound System, and more! In the video above from his Facebook page, our friend Pete Potipcoe from K97 took the words out of our mouth about the F-350 King Ranch®, calling it “beautiful” and “perfect for truck guys”. Take a look and see what else he has to say about what he called the ‘Alberta Limousine’ (along with a special shout out to our amazing Used Car Supercenter). Want to learn more about the Ford Super Duty? Explore our website to do all your vehicle research before you buy from our dealership!